became inseparable part of our family. These beautiful little white dogs have brought vibrancy and joy in our lives, and changed so much, in a positive way, our previous understanding of life. After couple of years of learning about care, concern and getting to know the breed we introduced in our lives in 2008 young lady Pleasurable Moments of Marquess "Kelly" from the famous kennel "Marquess". 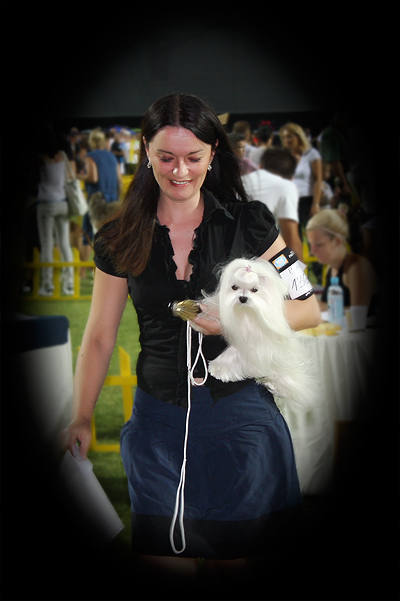 Thanks to Mrs. Szilvia Grof we get a chance to take care of this beautiful female maltese. With Kelly, we experienced the magic of exhibiting, socializing with other exhibitors and getting some really good friends. Our desire is that in the future we contribute to the breed with primarily healthy and typical samples as it is our Kelly. Hopefully we will succeed but until then we will continue to travel, socialize and close new championships.